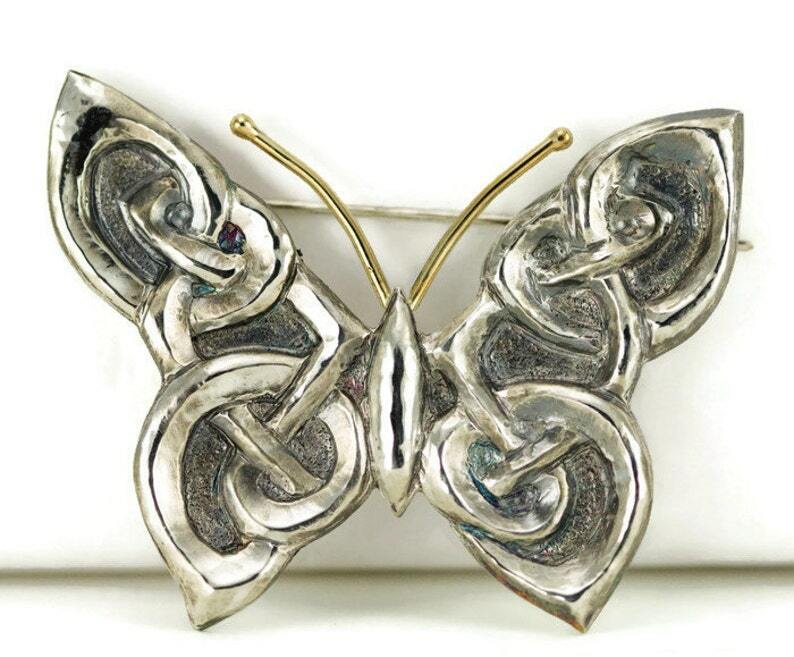 This three dimensional Celtic butterfly brooch was created using the fine art of hand chasing and repousse. The 18k gold and sterling shawl pin started with sterling silver flat sheet and transforming it using hand made tools on front and back, flipping it as need to get all the fine details. I started with a medium weight sterling silver and hand chased the design using steel tools. Then repousse (punching the metal from behind the design) on the back added dimension to this beautiful design. For the antennae of the butterfly I used 18k gold wire in a nice heavy gauge to make them prominent . The pin back is hand formed from sheet and wire and is flexible but springy. The pin end is rounded to handle most fabric but I would not recommend it be used on silk or other tight weave light weight materials. The front of the brooch received a light patina to add a bit of contrast and subtle color to the recessed areas. Forgotten for decades, the brooch is this season’s most on-trend accessory, this brooch looks nothing like nothing your granny would wear. The butterfly is 2 1/4 inches wing tip to wing tip and approximately 1 1/2 inch tall at the highest points. I used a sterling silver, 2 inch pin on the back to allow gathering fabric if preferred, pin can be shortened a bit and will still be secure. The Celtic butterfly symbol represents transformation, inspiration, and rebirth. The concept of rebirth with the Celts is particularly of importance in terms of recycling of life - both in the spiritual and physical realms. Chasing and repousse is a process where I start out with a flat sheet of sterling silver. I transfer a design to the sterling and then using various sizes of straight and curved chasing tools and a chasing hammer the outline of the design is chased on the front of the piece. During this whole process the piece is held in a bowl filled with a sticky pitch. Once the design is chased on the front, the piece is turned over and is punched out in the appropriate areas, this is the "repousse" part of the process. The piece is worked back and forth from front to back until it has been refined, textured and then any additional elements are soldered on. Your brooch will ship in packaging suitable for gift giving. I provide a gift box, a drawstring pouch. Inside your pouch I include a plastic bag with anti-tarnish square for keeping your jewelry protected and a square of Sunshine polishing cloth to get that extra sparkle before wearing.